This federally qualified community health center is proactive in its campaign for better health care access. This annual chronicles some of its achievements. To be willing to step out in front, to advocate for what you believe in, to risk, to try new things, inspired by a collective mission. 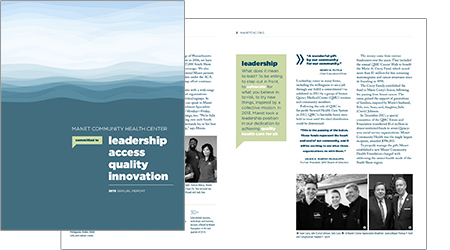 In 2013, Manet took a leadership position in our dedication to achieving quality health care for all. Leadership comes in many forms, including the willingness to see a job through and fulfill a commitment—as exhibited by a group of former Quincy Medical Center (QMC) trustees and community members. Following the sale of QMC to for-profit Steward Health Care System, QMC's charitable funds were held in trust until the ideal distribution could be determined. "This is the passing of the baton. These funds represent the heart and soul of our community, and it will be exciting to see what these organizations can do with them," said Grace E. Murphy-McAuliffe, former President of the QMC Board of Directors. The money came from various fundraisers over the years, including the Marie A. Curry Fund, which raised more than $1 million for free screening mammograms and cancer awareness since 1998. "A gift for the community by the community," said Manet CEO Henry N. Tuttle.